So, you want to visit New York City without breaking the bank? Never fear! There are plenty of ways to see the Big Apple and save some green while you’re at it. There are plenty of places where you can still see the sites and have great, postcard-worthy experiences, without spending a fortune. Here are a few of our favorite tricks. Don’t forget to check out all of our travel deals and special offers! As with any destination, there are good times and bad times to visit New York. If your concern for timing is purely economic, you’ll want to visit in January and February. These colder months are the low season and hotel occupancy rates drop off dramatically after the holiday season concludes. This is also the time when Broadway (and off-Broadway) shows have more discounted tickets available, museums will be less crowded, and restaurants have more reservation slots available. Remember to bundle up though as the weather will likely be cold and wet. If you’re the type who likes to participate in a lot of outdoor activities when you travel, you might do better in late spring or early autumn. Avoid the summer months as the city will be hot and humid, not to mention crawling with other tourists, during July and August. Likewise, sightseeing is often best during these months when the weather has warmed up a bit, but the crowds have not yet arrived (or have already gone home). If you’re flying into New York, there are a few things you should know before you book those tickets. First, remember that there is more than one airport servicing New York City. 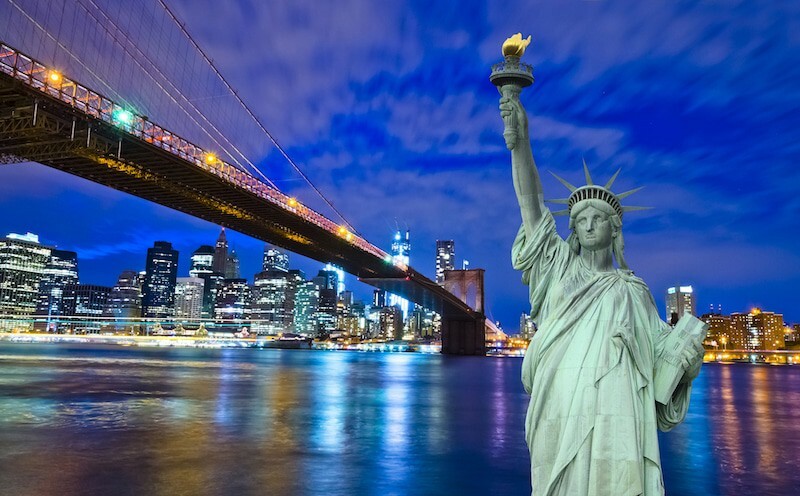 Most people are familiar with John F. Kennedy Airport (JFK) but you should also be sure to check out flights arriving at LaGuardia (LGA) and even Newark (EWR) as they may be cheaper for your particular dates or from your home area. Likewise, it might make sense to depart from a neighboring city’s airport, rather than the closest one to your home. Next, shop around. If you’ve only looked at one website, you probably haven’t found the best fares yet. Some of our favorites are Expedia, Groupon Getaways, Travelocity, Orbitz, and Southwest Vacations, but we have a whole page full of deals and promo codes for flights, so be sure to shop around until you’re reasonably confident you’ve found the deal that works best for you. The Golden Hour: According to the New York Times, the best time to book a ticket on those sites is Tuesdays at 3pm (EST). This is because fares are typically published on Monday morning, then adjusted to beat the competition on Tuesday, with the final “sale” pricing showing up online Tuesday afternoon. While you might find it more convenient to book on the weekend or late at night, you’ll get the best selection of discounted tickets then, so it’s probably worth checking out. New York is famous for its landmark hotels. Iconic properties like the Waldorf-Astoria, the Four Seasons, the St. Regis, the Ritz-Carlton, and the Plaza Hotel have been featured in countless movies and television shows. But along with their famous names, they often feature higher than average rates. While these lovely properties are great places to splurge, there are plenty of less expensive options to be found in and around the city. Pod 51 in Midtown East, with it’s compact but functional rooms, rooftop deck with stunning views, backyard garden terrace, and fun and funky on-site cafe is a great budget property right in the heart of the action. The Bowery House in Nolita began life as a flophouse in the 1920’s, but today is a stylish and centrally-located hostel, catering to history buffs and those seeking inexpensive accommodations alike. Yes, you’ll need to share a bathroom, but we think you’ll agree that the price is worth it. Sohotel in Little Italy lays claim to the title “the oldest hotel in New York”, dating all the way back to 1805. This beautifully appointed boutique hotel offers access to a craft beer restaurant and bar, fresh organic Italian restaurant, and E&C Lounge Studio, all on its first floor. Above you’ll find 100 beautifully appointed guest rooms with comfy beds, and a touch of that New York character found nowhere else on earth. The Hotel Pennsylvania is a true gem just across from Pennsylvania Station in Manhattan. Choose from their classic rooms or newly renovated Penn 5000 roms for an impressive value right in the heart of Midtown. In truth, New York is one of the priciest cities to stay in the country, so do remember that “affordable” is relative here. This is because square footage is at a premium in the city. If you’re planning to spend some time at your hotel and want more than just a place to lay your head at the end of the day, it might be worth looking at options outside of the city and commuting in. As with airfares, it’s often a good idea to shop around to get the best hotel rates. A few of our favorite sites are Marriott, Hilton, Hotels.com, and Holiday Inn. 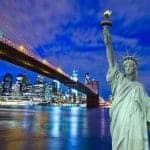 Of course, New York is packed with lots of expensive attractions and shows, but there are plenty of free or cheap things to see and do as well. This is where you can really save a lot, and still have a great collection of photos to show off when you get home. Here are a few of the most iconic picks. Brooklyn Bridge: New York City is home to over 30 bridges, but possibly none so famous as the Brooklyn Bridge. The pedestrian and bike pathway above the vehicle lanes is a great way to get up close and personal with this landmark, and you’ll get some great views of the East River and the city skyline too. Start in Manhattan near City Hall, or on the Brooklyn side at the intersection of Tillary St. and Adams St. Both are easily accessible from the subway. Bryant Park: Every year, this park hosts over 1,000 free activities, classes and events, plus you’ll find a games area, Pétanque courts, and other fun community activities. You’ll also find a host of arts and cultural programs with everything from Shakespeare’s most famous works, to open air musicals, dance parties, and even operatic performances! There’s always something going on, so be sure to check out their calendar before your trip. Central Park: What could be more “New York” than Central Park? This free public park has been an important part of city life since 1858. There’s always something to see and do in the park, from street performers to playgrounds, statues to arches and bridges. For family friendly fun, check out Victorian Gardens amusement park ($8.50/$9.50 admission plus ride tickets) or the Central Park Zoo (admission runs $13-$18). Grand Central Terminal: So much more than just a hub of transportation, New York’s Grand Central features a wealth of options for dining, shopping, entertainment, and more. There is always something going on, something to see, and something to do. For a bit of added interest, you can rent an audio tour device in the terminal for $9, or download the app for $4.99 and find out about the history, architecture, and other features of the terminal. The High Line: Formerly a freight line travelling above the city, The High Line has been converted into a beautiful and scenic park. Floating above the streets of Manhattan’s west side, this public park is home to water features, wildflowers, and wide open lawn space perfect for picnics. If you’d like to know more about the park’s history and design, join in a free walking tour on Tuesday evenings or Saturday mornings. The Statue of Liberty: Since 1886, Lady Liberty has stood in New York Harbor, greeting visitors and immigrants alike. She’s a symbol of freedom, and of New York, so it would be a shame to miss her. Fortunately, you can get a selfie with the statue for no cost at all! For the most frugal way to see the statue, take a free ride on the Staten Island Ferry starting from Whitehall Terminal. You’ll get close enough for some great photo ops. If you prefer a more hands-on visit, there are three types of tickets. One will take you all the way to her crown, one will only allow you access to the pedestal of the statue, and finally, one only gives you access to the grounds on Liberty Island, and they range from $18.50-$21.50. All ticket levels also give you access to Ellis Island. During busy times, Crown Reserve tickets can sell out six months in advance, so be sure to book early. You’ll also need to pay for ferry tickets to the island, so don’t forget to budget those too. You’ll also find find great deals on tickets to some of the hottest shows in town on sites like 365Tickets USA, City Sights NY, and Viator. For native New Yorkers, this almost seems like it should go without saying. If you’re not planning on leaving the city, there is no reason to rent a car. New York is one of the easiest cities in the US to get around without one. Walk, take the subway, hop on a bus, train, or ferry, or hail a cab, Uber or Lyft driver, to get from place to place without having to deal with constant traffic and sky high parking fees. If you are planning on venturing outside of the city and would like a rental to experience autumn foliage, or visit neighboring states and other nearby cities, we have some excellent rental car deals and promo codes from Alamo, Enterprise, Hertz, Avis, and more.